You are here: Home / Non-fiction / Personal Growth / Born With It: Unleashing Your Greatness by JB Smiley Jr.
Born With It: Unleashing Your Greatness is groundbreaking in its approach to personal empowerment. It boldly states looking outside oneself for the solutions to personal struggle is not the answer. The answer lies within. 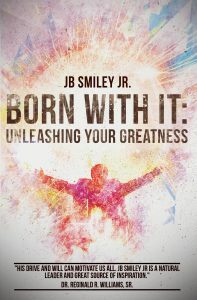 In this lighthearted, motivational book, JB Smiley Jr. explains that every individual is born with the necessary tools to excel and exceed expectations. Born With It: Unleashing Your Greatness is filled with practical approaches everyone can use as they go through life pursuing their goals. What inspired me to write this book? The answer is simply really—negativity. It is so pervasive in our society. You see it whenever you watch the news or get on social media. You hear it at work and you hear it in other social settings. It takes a toll on the individuals subjected to it. However, each and every one of us has the power to overcome. I want to motivate and inspire those people who feel limited or weighed down by the negative things they see or experience. I want to encourage them to continue pursuing their goals regardless of their circumstances. "Focus shares a symbiotic relationship with commitment. Without focus, we cannot be committed, and without commitment, no goal is within reach. To be successful, developing a focus that is shatterproof or strong enough to withstand both the expected and unexpected happenings of life is a must. Remember, if you focus on the road ahead, you are less likely to stumble." Excerpt from Born With It: Unleashing Your Greatness.